I would go by what strawbrad says. I must have been thinking about some other battery chemistry. I have read that also. I think its mainly people talking about single batteries. The 5 single batteries inside the module brings in a whole new dynamic. I'm in the process of rebuilding / balancing the hybrid battery on my 2007 Prius, ~155,000 miles. Module voltages measured 8.08-8.13V, with the exception of one bad module. Under load, modules measured 7.85-7.92V. (55W headlight). After 180 seconds under load, voltages dropped .27-.33V. It looks to me like module #18 is bad and needs to be replaced as its at a significantly lower voltage 6.86V. The rest of the modules appear to be at very similar voltages, even under load. The first 3 modules that I've discharged / charged cut off at a capacity of 7200 mAhr by the 2nd cycle and showed a final voltage between 8.98 to 9.14V. I'm concerned that the voltages on the cells appear to be higher than normal before discharge / charge cycles and the first modules I've run through a cycle are showing high voltages. Any advice? I live in a college dorm with a college student budget. I really do not have time (or money) to leave my Prius in pieces without campus police, tenants, etc.freaking out. I was wondering is it possible to replace the bad cells, put the battery back together, reinstall it and just drive as normal and eventually the cells balance themselves and all the warming lamp eventually turn off? If so how long would that take? The “whack a mole” approach doesn’t usually last long unless you find a module that is very similar to the other 27 in the pack (that can be challenging) . Since you are a college student, can your Prius be down for a couple of days while you repair it? It probably can. I can just Uber/Lyft around and ask for rides. I just cannot leave pieces lying around that need charging and discharging in the parking lot or just sitting round in the dorm. Neptune, California is in the fictional Balboa County, California (basically North and North County San Diego and sometimes JUST San Diego). It is from the hit television series "Veronica Mars"
Okay the results are in, I have two cells out fourteen out twenty-eight that need replacing. I thought it was one continuous row. I guess it is divided in half? The paperwork does not show which ones need replacing. Is it possible to purchase pre-balanced cells? So here we go, again. What is my first step guys? There are 28 modules and two modules make up a block. So there are 14 blocks . If they told you that 2 were out, why didn’t they give the associated code? Did they tell you the voltages of the blocks? Once armed with better knowledge, then the fun begins . I would avoid the whack a mole approach as it won’t last long and you’ll not like doing this same task again and again and again . I was told over the phone and told to wait for billing to call. By the time they did everyone in service was gone. I remember the repairman not suggesting cell replacements. 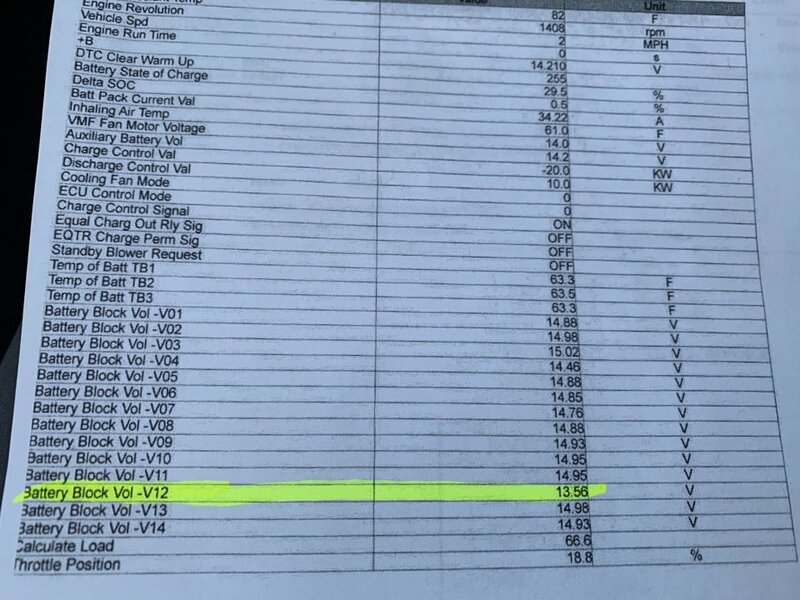 The paperwork only gives model numbers and information for the complete battery. Which is over $3500. I guess I will have to go over tomorrow and ask. If you can replace single modules yourself you can replace an entire battery pack yourself. Can you come up with 1600? That would get you 2K1Toasters kit. Brand new batteries that will not give you problems for many years. You might even get a few bucks back on the old batteries to reduce that cost some. I am considering on leaning in that direction after getting so much conflicting information like this. I do not mind replacing some of the cells if it can get me to September when I my next wave of scholarships and financial aid that can easily pay for this. Does 2K1Toasters Kit have a website by any chance? Does 2K1Toasters Kit have a website by any chance? after getting so much conflicting information like this. Both of those are true, to a point and it really does depend on what you want out of it. Most of what is important is to understand is, how long the fix lasts. The first quotation is an option if you need to get by for up to 6 months, but rest assured will will be back in the battery to replace another module sooner than later. The second option is maybe better, but it depends on a whole lot of factors like age of modules used, residual capacity of each module used, how well matched to its peers each module is, etc. If the it was the best possible rebuild it might last 1-5 years. It may be no better than option 1. You just don't know. It is a crap shoot. 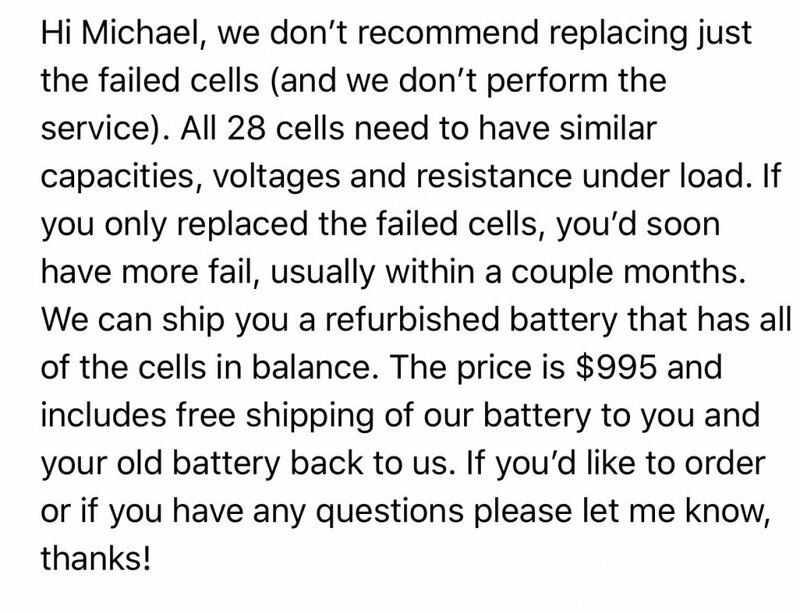 And price wise, if you are paying any more than $300-$400 for a secondhand battery, you really are better off putting that money toward a set of new modules. Then you can offset the cost further if/when you sell you current Prius modules at $20-30 a piece, depending on how good they are. Even the dead one(s) (the one(s) that caused your battery to fail) can still be sold as junk for $5. One factor you need to consider if you do sell your old modules, if ever you (or a subsequent owner) needs to supply a core in exchange for a genuine Toyota replacement you will need to purchase 28 of those $5 junk modules to reinstall in your case. Keep all the wiring anything else you do not reuse too, so you can build that battery core.  If you were a person of good character, you should disclose this information as part of any sale of the car, so the prospective owner can make a fully informed decision. Anyway, didn't intend for this post to be this long. Hope you success in whichever way you decide to go. Thank you, I will look into it when I get home. I am at Toyota. Wow, the battery is actually in really great shape. It is just two cells in the same module giving me all this trouble. Now, what? I wouldn’t say it looks that great, but block 12 is the current issue . Block 4 isn’t looking so hot tough either . That could probably be saved with the Prolong equipment, but one of the 2 modules in block 12 has lost a cell and hence it is 1.2 volts lower . But now you have more info on what to do . Wow those New Prius Batteries sound amazing because of how much smaller they are. If only that could be used for more trunk space or a larger compartment under the trunk floor. Not sure if I should get the $1050 or $1350 one. I live in a state that is covered by their mobile service. I do not think they are allowed on or to perform the service on the dorm and school property. However my friend says they can use his carport. I have just enough of my financial aid to do this and I guess I can make it back up by ride share drive in my spare time. Wow those New Prius Batteries sound amazing because of how much smaller they are. They aren't actually. The occupy the same overall footprint There is one newpriusbatteries module for every two OEM. Overall they occupy the same space in the case. One word. DON'T! I'll say it one more time, DO NOT! buy Greentec. Trust us on this. Better still just a search here on PriusChat using the search word Greentec should be enough to convince you. Once again, do not buy any reman/rebuilt/remanufactured/re-anything battery. Go new or fix it (i.e. module replacement) yourself. That way you will know what is done and that it is done properly. You will need to spend some time to learn what you need to do and buy the equipment you will need. But you will get a much better result. And when it fails (and it will) you will only have yourself to blame and as an added bonus you get to do it all again. When you have had enough "fun" playing whack-a-mole you will end up replacing with new. So you may as well bypass all the pain and go straight to replacing with new now. Seen this scenario play out so many times and yet people still purchase from Greentec and their ilk. And that bloke at Greentec must be very convincing, because he seems to throw out his line and reel them in. However, I fear he would sell his daughter to the mafia, and if his lips are moving he's lying. On second thoughts maybe I won't say that out loud. I am going to do a little more research on New Prius Batteries. What do you have to say about my second choice Home Town Hybrids. With this one I am not in the mobile service area. Hometown Hybrids (HH) have a better reputation on PC, but I honestly do not know what process they follow when they do rebuilds. So my opinion is the same as above for their rebuilt option. He does warrant the rebuild for 2 years/50,000 mi, so there's that. I would trust him to still be in business in two years. Out of interest, if you used HH, would you drive to TX? Will you be paying someone to install the NewPriusBattery (NPB), if you go that route? If so, you can add at least $400 to the price. You could ask HH whether he would fit the NPB modules and for how much, but the real attractiveness with the NPB option is savings on the labor by doing it yourself. The theoretical saving is only $25 (NPB $1600; Toyota New $1625 <– wholesale and before taxes) if HH does it for you. My genuine personal advice to you is, if you intend to keep the car for 3 or more years (assuming everything else about the car is above average and it has a history of being well maintained), find a way to do a replacement with new modules. The HH price for Toyota new is very reasonable, as is his warranty, which is better than Toyota's. At the end of the day you need to do the due diligence research and make a decision with which you are comfortable. No-one can tell you what to do. Hometown Hybrids (HH) have a better reputation on PC, but I honestly do not know what process they follow when they do rebuilds. So my opinion is the same as above for their rebuilt option. So based on that and given what we know about them as a company, I might be open to using one of there rebuilds, if you want a two year solution. 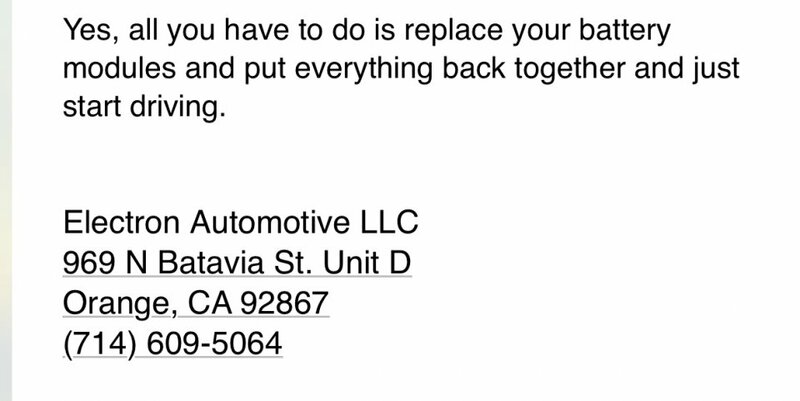 Warranty is for 2 years/50,000 miles, so you should get at least that. And that is a very confident warranty for a rebuild. I have an installer in the LAX area that does mobile installs. It would be a drive but less than to Texas. You can put up as many "what about this option XYZ", but they are all used. Plain and simple. Toyota and myself sell new batteries. Everyone else sells used. Skibob, TomB985 and Raytheeagle like this.